Sharks Can Have Bellybuttons – and other facts about their incredible diversity. New article by Founder and Chair Dr. Georgia French on her latest white shark research and the incredible diversity of sharks. Originally published by The Conversation. The first thing that pops into most people’s minds when they think of sharks is of big dumb fish with pointy teeth that are to be greatly feared. But as someone who spends their days studying these creatures, I know just how wrong that image is. For one thing, the diversity of sharks is astounding. The differences between species can even make it seem like some of these animals are barely related. You can even tell individual sharks apart based on their appearance. NASA developed the algorithm that is now used to identify individual whale sharks by their spot patterns (it was originally used to map stars). Each whale shark has a unique pattern that can be identified like a fingerprint, and software is now used to catalogue photographs of individuals to help us monitor their numbers and movement patterns. 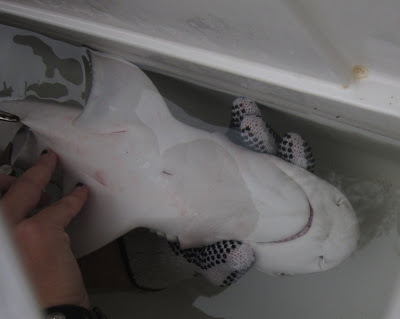 Several other sharks and rays are now identified by various pattern features. White sharks can be identified by the notches on their dorsal fins, as well as other distinguishing features.